A deposit of £100 to secure the date can either be paid by cheque or by direct online bank transfer. The balance can be paid on the evening or transferred in advance, whatever suits you best. I am thinking of booking The Deltatones, what do I do next? Please contact us! Either via email contact@thedeltatones.co.uk or by phone (07791830212) or (07902171280). We will tell you immediately if we’re free on the date that you require, we can then give you a quote and to secure the booking you would just have to pay a deposit. Yes! All our equipment is PAT tested annually for electrical safety. Yes! The Deltatones are covered by a £10 Million public liability insurance policy. Will your PA System be loud enough? Yes! 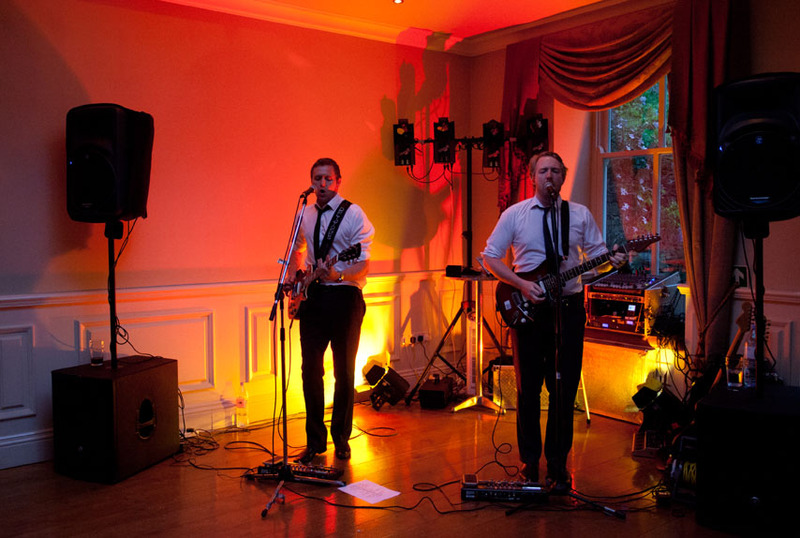 We have played in a wide variety of venues ranging from intimate clubs to big halls and arenas. We use a top of the range – 2.8KW Mackie Active PA System with 2x Mackie SRM1801 Subwoofers and 2x Mackie SRM450 loudspeakers. We run our Shure SM58 Microphones through our 18 Channel Mixing Desk with build in Effects and rack mounted vocal compressors. We monitor our sound by using the latest IEM (in ear monitoring) technology. How big a performance area do you need? Preferably 5m x 3m but, we’re flexible and we can play on a smaller stage if required. What power requirements do you require on stage? What do you wear onstage? We wear smart dark blue stage suits, with white shirts and dark blue ties. We also wear 60’s style leather boots for authentic stomp box operation! Can you provide me with a contracted service? Yes. For corporate clients or anybody who wishes to be invoiced we can supply invoices, contracts and receipts wherever necessary. To avoid disappointment, you should book as soon as possible! We have bookings and current enquiries in excess of 3 years in advance at the moment. To be as fair as possible, we work on a first come, first served basis. Will you learn a specific song for my live first dance? Absolutely. All we ask is that you give us a minimum of 4 weeks notice so that we can rehearse your song. Where are you based and are you willing to travel for my wedding? We are based in Liverpool, but we are happy to travel almost anywhere to play, but please bear in mind that our quote will reflect additional travel charges. For example, a wedding in Liverpool will be a lower quote than a wedding in London. Can I pick all of the songs I want you to play? There may be some songs in our repertoire which you definitely want to hear and maybe even some which you would rather we didn’t play and we’re always more than happy to oblige, however even we won’t choose every song we will play in advance. Our advice is that it’s always best to leave the set lists up to us as we know what works best in a live situation. Venue permitting, it normally only takes us 30-40 minutes to set up our equipment and lights. We will arrive 1 hour before the evening function is set to start. If we are providing the disco service for you, we usually start at 7pm, so we would arrive at the venue at 6pm. Our standard 2 x 45 minute live sets usually run from around 8.45pm – 9.30pm and then from 10.30pm- 11.15pm, but this is totally flexible. We’re more than happy to move these sets around to suit your needs. We can even do one long 90 min set if that would suit you better. If you’ve also booked our disco service then this will usually run in conjunction with the live sets from 7pm to 1am venue permitting. However if you require an early start or indeed a late finish, we would be happy to arrange this for you.